Symbols*: The flowing waters from the ocean are burgeoning with life. From the waters inspiration takes flight, represented by the doves. 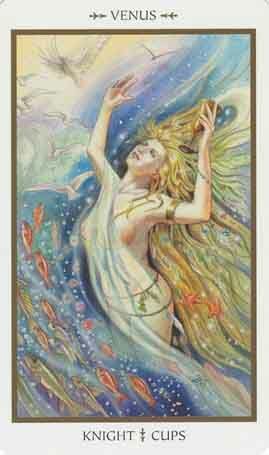 The abundance of fish symbolizes renewal, fecundity, and powers of the unconscious. The starfish symbolize love and can serve as a motif for solar rays. The goddess’s flowing hair is reflective of her stream of consciousness. Feathers and flowers exemplify her youthful energy and desire to explore her own sensuality and creativity. The roses are emblems of love and passion. The circular gold armband emphasizes eternity. Description*: Venus is the goddess of love. As a deity of love, spring, and fertility, she is the Roman version of the Greek goddess Aphrodite. Aphrodite, born from the foam of the sea, emerged from the sperm of Uranus after Cronus cut off his sexual organs. Her idyllic beauty attracted many lovers but, like many of the gods of the Greek pantheon, she displayed human.like weaknesses. Venus assumed many of Aphrodite’s attributes and became a cult figure during the Roman Empire. Originally Venus was a goddess of vegetation and gardens. A spring festival known as the Vinalia was celebrated in April, a month sacred to the goddess. Her influence spread across the Roman Empire, resulting in the construction of a great temple built in her honor. Possible Meaning: Now is the time to go with the flow and engage in tasks that reflect deep spiritual or emotional qualities. If you feel that there are some aspects of your life that remain detached and mundane, contemplate ways in which you can be reinvigorated. Be open to new people and relationships that may emerge at this time and allow you to experience a more sensual aspect your being. Thoughts/Points to Ponder: She is a dreamer, she is very romantic, and she only sees the positive and the most beautiful side of things. She is gorgeous herself. The fish, even salmon and starfish are surrounding her. There are also birds in image. Even though she is underwater, by the birds being present, it shows that everything is merged – there is no sky nor ocean, but it is one and the same. She is very intuitive and has a strong spiritual connection with water. She is creative. I feel pure bliss and love while I’m down here.